Sebastian with a little tiny Ciel. . Wallpaper and background images in the Sebastian Michaelis club tagged: sebastian michaelis black butler. 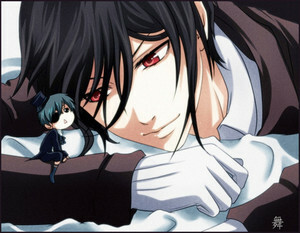 This Sebastian Michaelis fan art might contain anime, comic book, manga, and cartoon. He looks like Vincent in a way but with Black hair and red eyes.Why do they look similar?!! @FoxyFan441 I have no idea my friend. I would love to know.